The World is Alive, and WE are a part of It! This book by Quynn Elizabeth is for sensitive people who are remembering their connection to the living world around and within them. Do your dreams and intuition guide you? Do inanimate objects (such as rocks and wind and trees) come “alive” to talk to you? Do you have a special affinity with animals? Do you feel peace in Nature, and do you feel called to spend more time in Nature? The wisdom is simple, The message is clear, You are a part of the world, my dear. 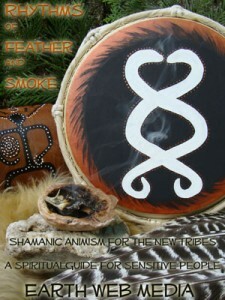 “Rhythms of Feather and Smoke” The new E- book created by Quynn Elizabeth Red Mountain for Earth Web Media.